up to date, like you. We seldom went places together. on the one room, ours. like love strokes in the dark? I still have your picture. I am indebted to Lynne Brown for introducing me to this wonderful poet. This beautiful poem by this early Christian mystic, expresses most vividly the connection the mystic of all ages and traditions feels with divine presence. As a devout monk, Dionysius predictably pays tribute to the contribution of sacred text in his profound spiritual consciousness. Yet, the mystic who delights in divine connection, sans text and ideology, also partakes of similar awareness and sense of union. This consciousness may--and often does--include Kundalini as the engine of such enlightened states, for the Kundalini path in its highest manifestation reveals the oneness of self and highest Other. 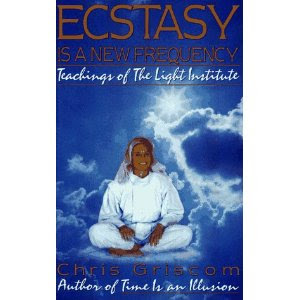 Chris Griscom is a pioneer of the "new consciousness" movement. Some twenty or more years ago she became famous as the healer who regressed Shirley MacClaine into numerous past incarnations, and subsequently she introduced thousands of people to the notion of multidimensional reality. She has long been of special interest to me, because after I experienced awakening some thirty years ago I read her early book called "Ecstasy Is a New Frequency, Teachings of the Light Institute" at a time when similar approaches were few. I was especially impressed by the fact that she talked openly about ecstasy, something I was experiencing a lot of at the time but about which I knew very little. Chris Griscom was born Christina Johnston on 3 June 1942 in Los Angeles, California, United States of America. As a child, she traveled extensively with her father, an agricultural entomologist. 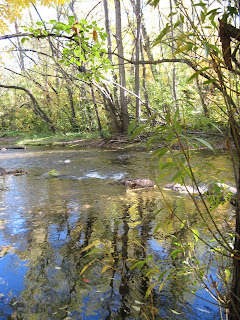 This early immersion in nature is credited with awakening in her a deeper awareness of the interconnectedness of life and setting the stage for her life’s work. In 1962, Ms. Griscom volunteered for the Peace Corps and spent the following nine years working as a Peace Corps representative throughout South America. During this time, she began to experience the various spiritual beliefs that characterized the native cultures with which she was involved. In El Salvador, through the direct experience of the monumental mortality rate around her, Chris awakened to an amplified awareness of life and death. Dealing with death on a daily basis, she began to see that life does not end with death, nor does the spirit die with the body. These realizations laid the foundation for her now internationally recognized spiritual work at The Light Institute and The Nizhoni School for Global Consciousness. She returned to the United States of America in the early 1970s, married Richard Griscom and settled in Galisteo, New Mexico. She soon began studying massage and acupuncture. Through this, she came upon what she calls the ‘Windows to the Sky’, what she describes as “a powerful, ancient form of acupuncture which precipitates awareness of the higher octaves or dimensions of experience.” This led her to work with many, including Shirley MacLaine. Like thousands of others, Shirley credits her work with Chris as enabling her to connect with her deepest and richest abilities and knowledge. Building on this work, Griscom founded The Light Institute in 1985, a spiritual center for multi-incarnational exploration and light healing. Seeing a need for soul-centered education, she founded the Nizhoni School in 1988. The school offered a standard academic curriculum combined with applied spirituality. Through this unique curriculum individuals of all ages from all over the world were taught to 'discover and access their inner wisdom and strength. In 2004, the Nizhoni School moved from on-site education to education through the media. It is now focused on the development of media programs with the purpose of reaching a greater global audience. While her reach has become global, Griscom continues to appear regularly on public access television in northern New Mexico, broadcasting her 'Knowings' talks that are open to the general public. A key aspect of Chris Griscom’s teachings is the Higher Self. She describes it as “the spiritual vehicle, the power that changes and awakens the emotions. It is the megaphone of the soul.” Through the Higher Self one comes to realize one is brilliant, essential and possesses abilities one never imagined. One begins to use these talents not only to make life more fulfilling, she says, but to create a way of living and relating that is open and inclusive. This happens automatically, for, she teaches, as the individual starts to discover her or his true self, she or he begins to comprehend the powerful forces that not only effect oneself but all of humankind; one discovers how multi-faceted, rich and wondrous are oneself, the world and every being. Griscom teaches that, according to cosmic law, we must continually expand the expression of the Divine. This is why we have come into body. That we now have the great opportunity in our bodies to be the expression of Divinity, to further the expression of the Divine; and that we, as human beings, have the unique opportunity to do so from the position of the heart chakra. Griscom teaches that we can learn to use our creative energy to activate the "heart chakra". We can shift our consciousness from the lower chakras, which are solely concerned with survival and procreation, to the "heart chakra". Once we learn this, we will move on to “the ever radiant (dimension) of life, where the heart is activated, where there is no separation, where there is a true merger with the Divine.” We will, she says, become the embodiment of the Divine force. and which also enters me. I was on a candy high. It bounced off high stacked shelves. Interest in UFO's and aliens seems to be increasing exponentially. T. V. stations such as History International and PBS carry programs with the kind of information formerly found only on the "National Enquirer" and other such publications. Part of the renewed interest has to do the release of certain classified documents by the government, which contain accounts of sightings by extremely credible witnesses (military pilots, commercial pilots and other trained observers.) We can now hear the actual air to ground transmissions of such sightings. Even one former astronaut had such an encounter in outer space. The U.N. is ready to appoint a special ambassador to connect with the space travelers should they come forward. The city of Denver has a measure on the current ballot which would provide for further investigation of UFO phenomena. The Vatican has announced it accepts the reality of space aliens visiting planet earth, and says that these are also "our brothers." 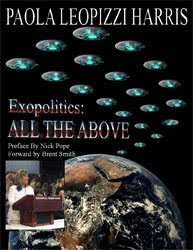 At a recent international conference on UFO sightings, the presenters included (among others) high placed officials of the governments of various countries, all of which had had many unexplained sightings. These unknown craft seem to be especially interested in our own military sites connected to atomic weapons. In one report, several missile sites were disabled briefly while unidentified flying objects hovered overhead. What are these unknown aircraft? Why are they here? Are they well intentioned or malevolent? Some think they have come to help earth in its time of need. Others (including the famous physicist Stephan Hawking) think they have a more nefarious agenda--perhaps even possessing a plan to exploit or even take over our planet. And still others point to great deeds of construction and engineering of past ages as proof that earlier visitors from outer space were here to oversee such projects, which were clearly beyond the technical abilities of humankind at that point in history. It is indeed as though the UFO phenomenon has captured the imagination of the world audience more than ever before. Are we being readied for a "special event," an encounter similar to that portrayed in movies and television shows? Should such an event occur, are we prepared mentally and psychologically for such an experience? For some reason, I keep wondering if this "awakening moment" is in some unknown way connected to Kundalini. Both--UFO visitations and Kundalini awakening--involve dramatic shifts of consciousness. Both are connected to energy events. Are they both part of the current evolution of consciousness, a transformation whose time has come? Will our energies match that of the visitors when they arrive? As always, YouTube offers several videos with valuable insights on this topic. The following website contains links to several of these, all offering special perspectives on the subject. In the last several months, I have noticed that my own "bliss energies" seem to come into play during the time of the full moon, with little activity at other times. This month I noticed that nothing seemed to be happening, but the truth is that I did not feel well on October 23, the date given on the internet for the full moon this month. But, voila!, all that changed this morning (I now felt quite well). Once again, the energies were quite pronounced, even as I got out of bed. I immediately did my standing"practice" (a combination of very slow arm and body movements) with great pleasure, although--as I have mentioned before--the inner feelings are now quite subtle, more like chi "brightening" the various centers, or perhaps like light playing through the body. This time, I felt the energies moving through the legs and lower chakras, as well as the hands and arms and the upper chakras (my more typical response.) Part of it--at the beginning---consisted of merely hip rotation accompanied by hands circling in front of various parts of the body, palms facing. Everything, for me, is very simple, in terms of "what I do." For "what I do" is to follow the direction of the guide within, and again, I realized that the key is to let the guidance come from within, rather than to impose set patterns from without. My job is to show up and allow this guidance to lead me into an altered state. I have learned to do this in an awakening process that has now lasted for almost 30 years. I followed this essentially "blissful" experience with a few simply chi gong stretches, and after an hour, expressed gratitude for the experience (which is not predictable, really) and dedicated my "meditation" to the benefit of all. And, as usual, once I finished this standing meditation, my bliss vanished--I went back into "normal consciousness" and went about the business of the day. One of my favorite places in San Francisco is the Arboretum in Golden Gate Park. I always have a magical experience there, and my recent visit was no exception. 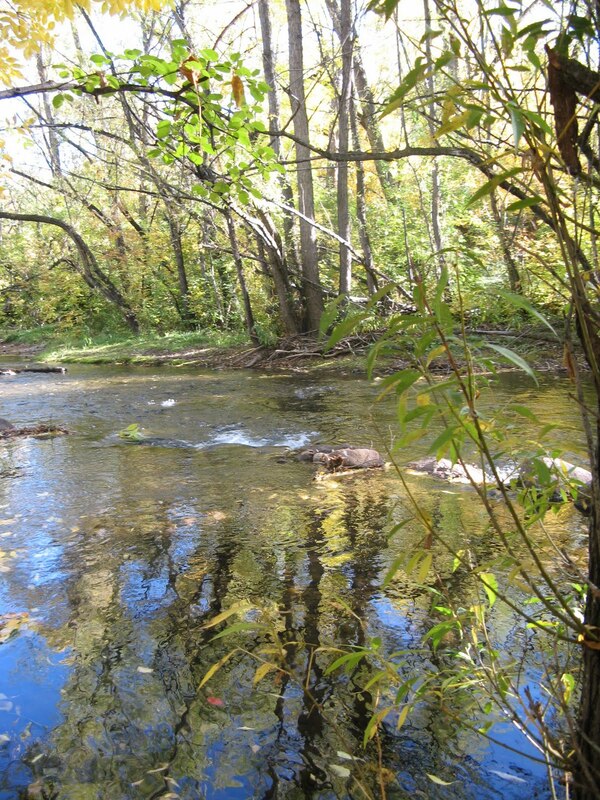 The Arboretum contains many flowering plants as well as a variety of trees, including a "Redwood Grove," Various forms of wildlife also flourish there, including geese, squirrels, heron, crows, and other fowl. I decided to travel there by bus, but unfortunately got off at the wrong stop. I walked a very long way to my destination, but somehow managed to conserve enough strength to spend an hour or so communing with the beautiful flowers and trees, some of which are always in bloom. Finally, I decided that it was time to leave, so I made my way (at a very slow pace) to the gate where I always exit. By now I was counting the distance to the next bus stop. But--much to my surprise--the gate was closed and locked. It seems that the Arboretum now closes an hour earlier than previously--a sign directed me to another exit some distance away. It was then that I noticed that everyone else had left, and I began to wonder whether I would be locked in for the night. But I finally made it to the other exit, and trudged the remaining few blocks to catch the bus back. I was truly sore the next several days from (for me) so much exertion. Symeon was born into an aristocratic family in Asia Minor (Turkey) and was given the name George. This was when the region was still part of the Christian Byzantine Empire. From boyhood he was groomed for a life in politics. At age eleven, he was sent to the capital Constantinople (Istanbul) to live with his uncle who guided him in his early education. When he was 14, George met a monk at the the monastery of Studios named Symeon the Pious. George accepted Symeon the Pious as his spiritual director while continuing to prepare for a life in politics. Somewhere around age 20, George was overcome by an ecstatic state in which, as with many other mystics, he experienced God as a living presence of radiant light. Despite this radically transformative experience, he spent several more years attempting to fulfill his family's expectations, eventually becoming an imperial senator. However, his continuing mystical experiences were not compatible with such a public life and, at age 27, he renounced his previous life and became a monk, entering the monastery at Studios to continue under the direct guidance his spiritual director, even taking on the same monastic name -- Symeon. Symeon was ordained a priest and eventually became the abbot of the St. Mamas monastery. The mystical spiritual practicesthat he advocated and his growing reverence for Symeon the Pious after the elder Symeon's death led to conflicts with authorities and Symeon was exiled in 1009 to a small hermitage on the far side of the Bosphorus. Disciples began to gather around Symeon and soon the small hermitage grew into a full monastery. (now back to me): Symeon the New Theologian is one of my favorites among all the early religious writers. He was someone who not only thought of God constantly as he practiced religious devotions as a monk, he actually felt God (Christ) in his body. I suspect that he was filled with what we might call Kundalini bliss or divine love. In fact, you can read his poem substituting "The Divine" or "The Beloved" or even "The Goddess" wherever he refers to "Christ", and the essential sense of the poem will be the same. Divine love is the same, however it may be expressed in words or theological terms. The poem is an accurate depiction of what happens when Kundalini bliss awakens, no matter what vocabulary is used to express it. Last Sunday, I attended a group viewing of Braco appearing in Los Angeles, sent via somethng akin to Skype. Unfortunately, technical problems prevented the viewing of the first session. Then the next viewing began, and, though we had the video before us, we (or at least I) could not hear the sound. But, since Braco himself is silent, we got a close up view of his face during this session. The image of Braco, cast on the wall, revealed a man serious, intent, concerned, and loving--just as he had appeared earlier in the flesh in San Francisco. But this time, my reaction was quite different. The result for me was one that frequently happens when deep emotions are brought to the surface--during certain workshops, massage sessions, even acupuncture treatment--one can become aware of unresolved issues, pressing into consciousness during this time of "opening." As a result of this "unresolved issue" emerging into awareness, I spent a very uncomfortable night--with leg cramps, "burning nerves" throughout my body, and sleeplessness. But, despite my discomfort, I realized that this insight was in fact a boon, for only through unveiling those hidden emotions lurking under the surface, can healing occur. It is the same, for example, with psychotherapy, where one must face certain unpleasant truths and come to terms with them to improve. The following days were quite wonderful. 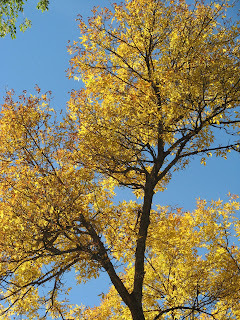 The sky was blue, the trees golden, and I felt energized and whole. The ultimate effect of Brazo's gazing was indeed beneficial. We were a bit anxious before the event. We had heard rumors of visa problems, and already two live appearances of this tour had been canceled, one in Jackson Hole, Wyoming, and another in Mt. Shasta in California. Would Braco appear in person in San Francisco? Or would we be looking at an image projected electronically from some other site? The visa problems were cleared, he was indeed there, and we all waited with great anticipation the appearance of this man of whom we had heard so much. The session included a lengthy preliminary presentation, explaining who Braco was and what we might expect. We also saw a video about his life and work. The piece included various testimonials from those who had been healed or helped by Braco. One case was that of a woman whose brain tumor had first shrunk, then disappeared entirely, much to the bafflement of her doctors. Then Braco appeared. He looked almost exactly like he does in his pictures and videos. He mounted a couple of steps on stage, so that all could see him easily. We, the audience, had been asked to stand for the session. As Braco began to gaze at the audience, I sensed a vey devoted, very spiritual, very tender and loving being. As for me, I found myself gazing at him with deep affection, sending love energy his way. And then I saw a clear light around his upper body. It appeared to have a thin rim of gold all around. The session ended after a few minutes and my friends and I went to lunch. The people coming out looked happy and I also felt this joy. And then I noticed that everything looked brighter, more beautiful than usual. It was a lovely feeling. During the second session, I again saw light about his body, but this time it was a shade of purple (the color I typically see when I happen to be looking at someone on a stage.) His was a "medium" purple, playing about his face and also outlining his body with a deep purple "rim" down to the end of his shirt. When we left, everything again looked sharper and more distinct. I felt at peace, for indeed I had participated in a field of love, created by a man who gazed at us with deep and serious intention, as if he were grieving slightly for the many ills of the world and wished to alleviate them through the gifts he possessed. My improved vision lasted for a few days, until other experiences occurred that focused my attention elsewhere and shifted my state of consciousness. I continued to feel exceptionally well after my return home. 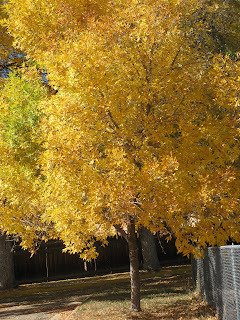 Of course, the beautiful weather, the glorious colors of fall--all helped to lift my spirits and my sense of well being. I think that there should be more Bracos among us. We all need all the love and light in our lives, from all the sources we can discover. Love is in fact the answer, and we flourish when we partake of it. Trips away are wonderful and renewing, but it is always good to come back home. 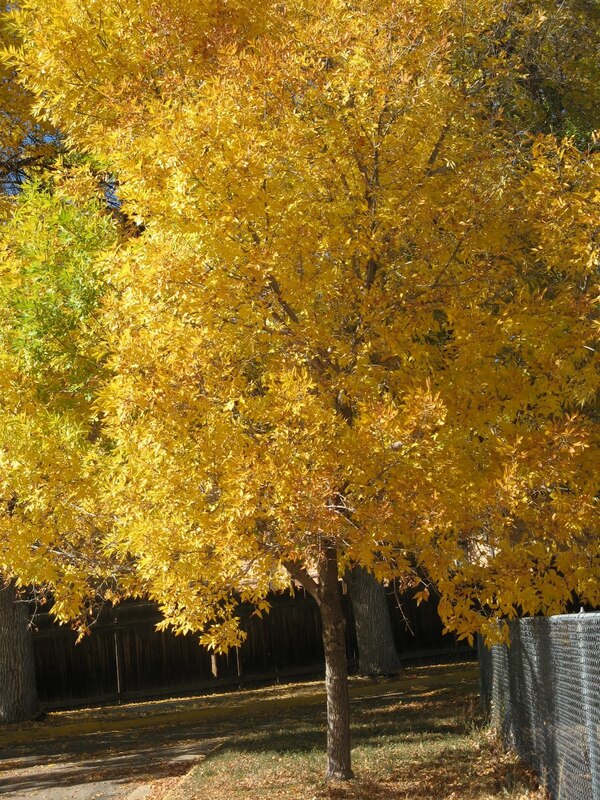 Boulder is now in its full glory of fall--a kind of golden paradise. Somehow, the brilliant spectacle reminds me of Shakespeare's sonnet which begins: "That time of year thou mayst in me behold/when yellow leaves or none or few do hang/against those boughs that shake against the cold" and ends "to love that well which thou must leave ere long." Indeed, we must love the sight of nature unfolding its final beauty of the year as fully as we can, for we know that soon all will be gone, buried under the snows soon to come. NOTE: I WILL BE OFFLINE FOR THE NEXT SEVERAL DAYS. GOING TO SAN FRANCISCO TO SEE BRACO, THE FAMED "GAZER" WHO HEALS WITH HIS GLANCE. I'LL BE BACK ONLINE ABOUT OCTOBER 14. 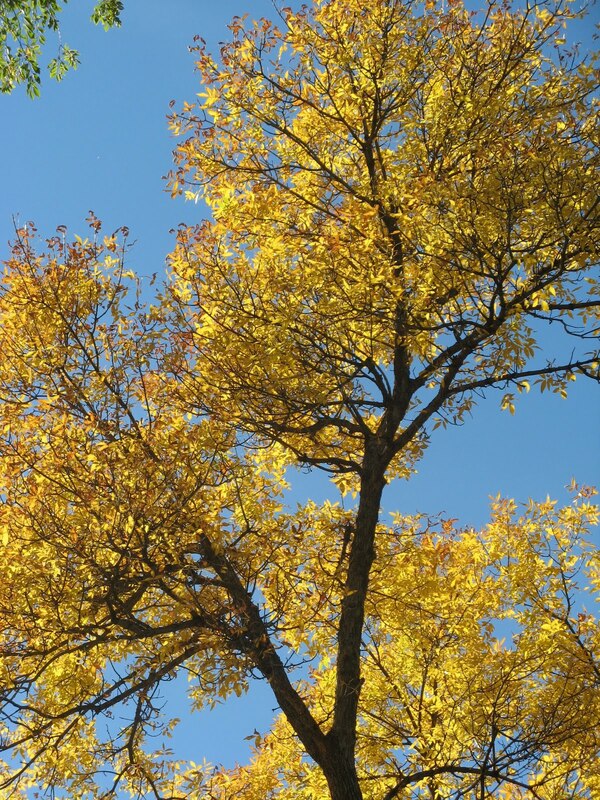 ENJOY THE BEAUTIFUL FALL WEATHER AND THE TREES TURNING TO GOLD.